Only available in 1986 the Facet was the only Centurion model that was made with a aluminum frame. the frame was a tig welded 7000 Grade Oversized Aluminum tubing. finished in Yellow with a Jet Black Fork. The Facet featured Suntour Sprint componentry. full specs are below. 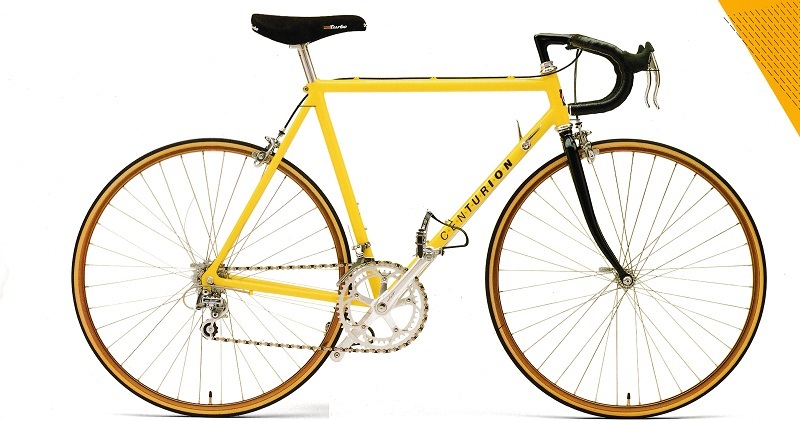 1986 was the only year the Facet or any aluminum tubing bike was available from Centurion. The Facet was also used in the Centurion/Shimano/Avenir/Texas Metros Cycling team which competed in the 7-11 Cup.Series The race team which consisted of Susan Ehlers, Marianne Berglund, Peggy Maass, Rebecca Daughton, and Bunki Bunkaitas. Used specially prepared Facet Bikes that were painted Pink with Dura Ace groupset. Sun Tour Sprint Aluminum Alloy Sealed System. Sun Tour Sprint. Sealed System. Cat Eye Plastic toe clips with Sugino nylon straps. Panaracer Vertex 700x23c Semi-smooth tread, Rated 115 psi.